I’ve just recently returned from one wild-west of an adventure over in Austin TX. 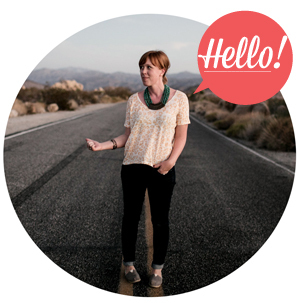 After spending a few days catching up with the fine peeps at the BlogHer Food conference and panel-chatting about turning your blog into a business, it was time to kick off my shoes and get to know the local side of ATX. And by local side, I mean the totally off-duty no more working let’s explore summer-timing already styles. Now there’s no question that the food and drink in Austin is always amazing. I’ve tried everything from bourbon strawberry pâté to Vegan BBQ on past visits and where everything is not only clever but divine, nothing can quite compare to the hidden world of cold springs, “toobing” and ziplock bags full of saucy meat. 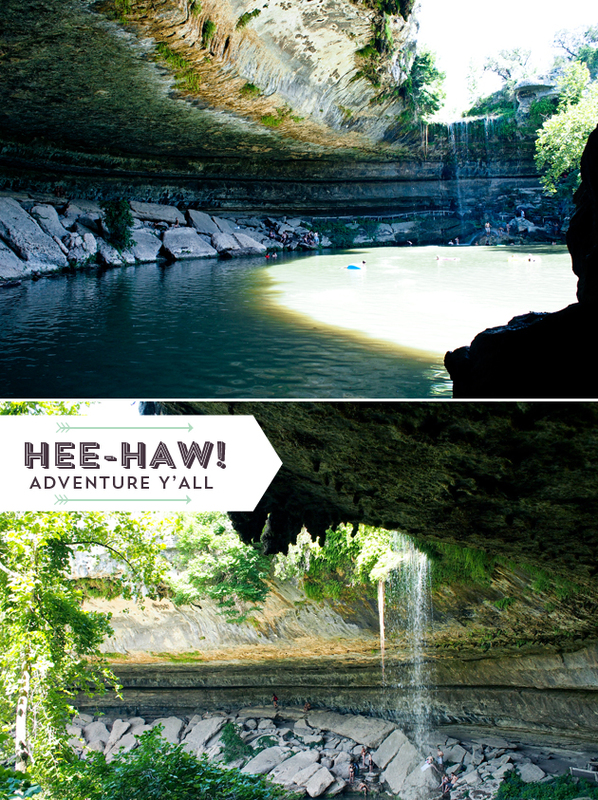 Hee-Haw – I’m talking about R&R on another level y’all! Becca, a long time friend, near-weekly Skype Happy Hour companion, proud Austin local and one of my favorite partners in crime took me out to The Hamilton Pool Reserve one steamy afternoon (oh the humidity! oh my hair…) which is by far one of the most beautiful things I’ve ever seen in Texas…well, of the nature variety. The Lamb & Pea Purée dish at Barley & Swine is a whole other story that deserves a pit stop of its own…I digress. On your next visit, do not let the auto-queue scare you away. You will sit there and wait your turn to enter, even it means 45 minutes, because know that you are about to witness one of the most spectacular watering holes of all time. Read: small intimate beach, cavernous explorations, water falls and hanging vines of wonder. Yup, we’re not in Los Angeles anymore…and I love it. 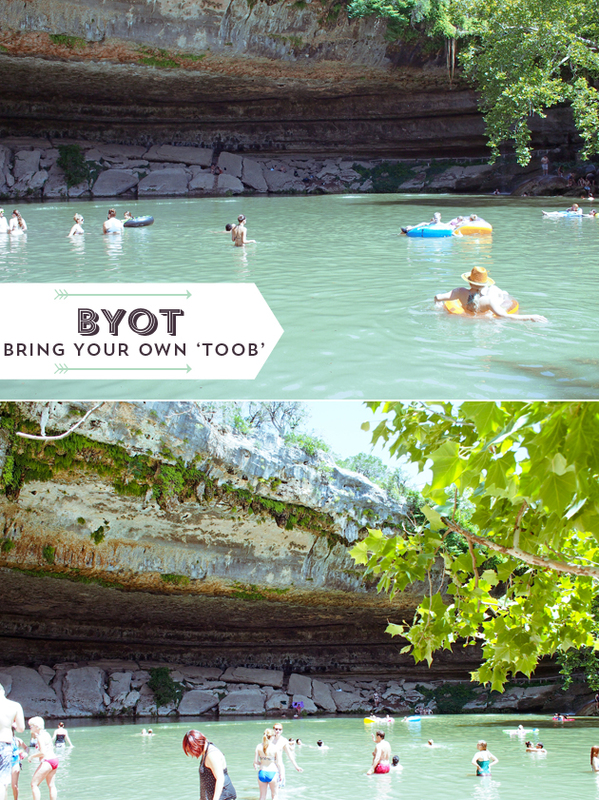 Part of the magic behind Austin water excursions is the art of the picnic. 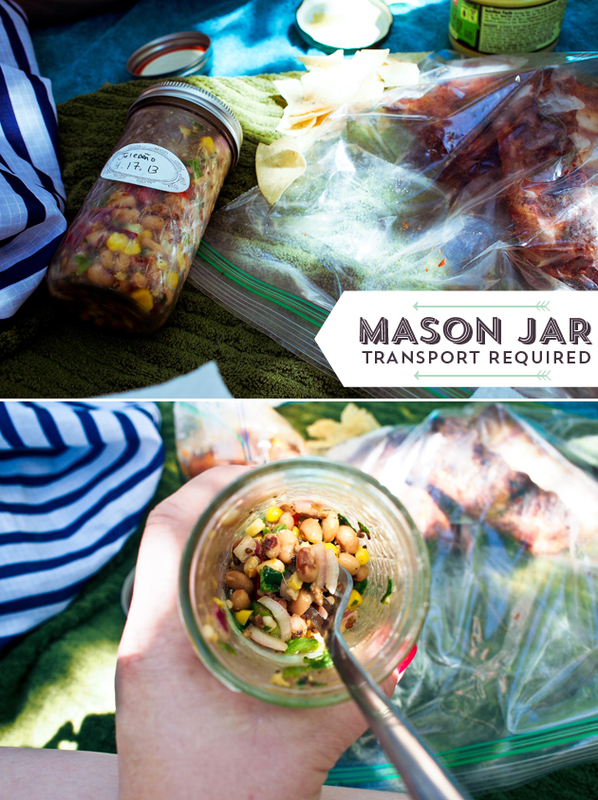 If you’re not toting mason jars full of awesome, you might as well deflate your water wings and head back home now. 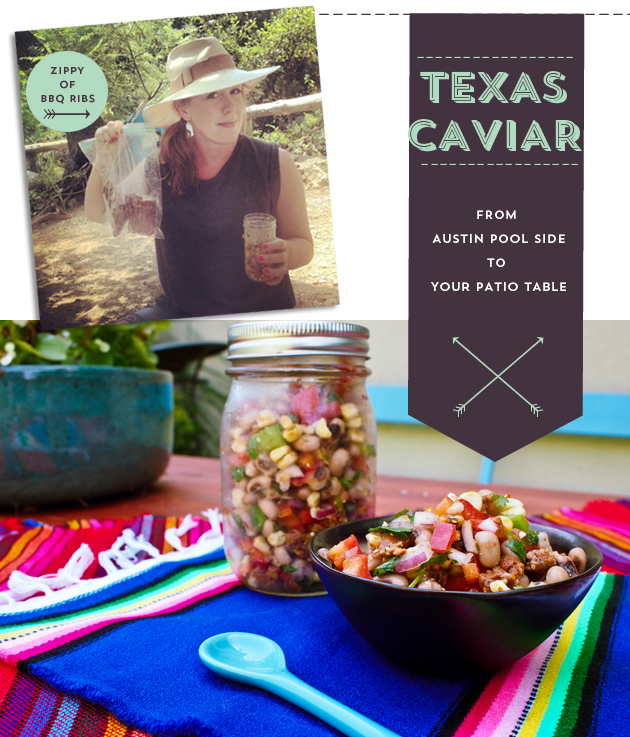 One of the easiest and widely popular side-dishes of choice is Texas Caviar. Already delicious on it’s own, we decided to accessorize this wonder with smokey chorizo and a plastic bag of left over ribs. I don’t know about you, but I’m thinking about whipping up another batch and running through my garden hose a few times. Summer is in full swing and regardless of not having natural springs at my immediate disposal, at least I have some pretty great taste-memories to keep the Texas spirit alive all summer long. Hope you’re able to channel some of that lazy toobin’ wonder at your home as well! Speak up pardner and tell me what’s your summer-side staple?! Even better the second day, perfect for summer picnics and flippin’ easy to make.